British foreign minister backs Israel's right to self-defense after Iranian aircraft violates Israeli airspace, Israel bombs Syrian base. Britain’s foreign affairs chief backed Israel’s military response to Iranian provocations over the weekend. “The United Kingdom is concerned at developments over Israel’s border with Syria this weekend,” said the UK’s Secretary of State for Foreign and Commonwealth Affairs Boris Johnson, after Israeli aircraft bombed a Syrian military center near Damascus. 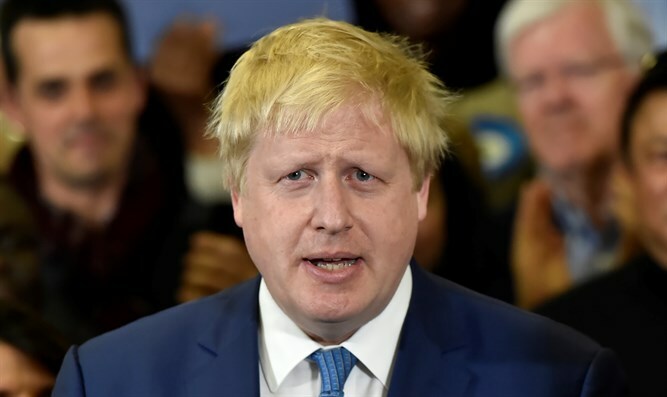 Johnson added that the British government was “concerned” by Iranian activity in the area, saying they impaired efforts to reboot the peace process. Israeli and Syrian forces clashed in the skies over Damascus Saturday, after an Iranian unmanned aircraft violated Israel’s airspace. Israel Air Force fighter jets were scrambled to intercept the Iranian drone, and managed to shoot down the unmanned aircraft less than two minutes after it crossed over into Israeli airspace. In response, the IAF targeted a command and control center near Damascus used to remotely operate the Iranian drone aircraft. During the airstrikes, Syrian surface-to-air missile batteries fired dozens of anti-aircraft missiles at a squadron of Israeli F-16I “Sufa” fighter jets. One F-16I was damaged by a Syrian missile, forcing the pilot and navigator to eject after they crossed back into Israeli airspace.